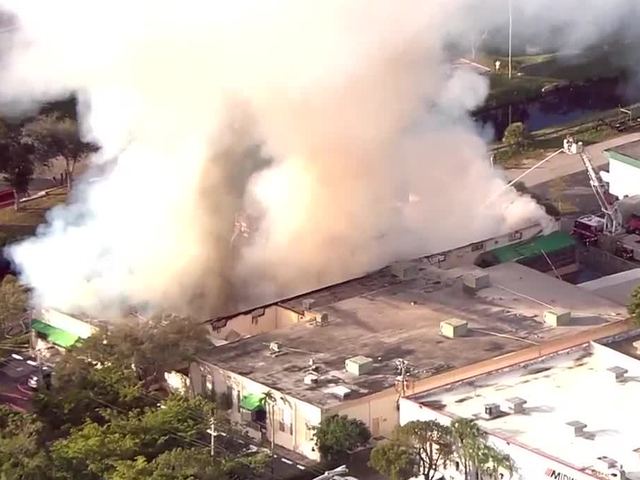 Crews responded to a massive warehouse fire in Fort Lauderdale that broke out Wednesday morning. Firefighters arrived at the scene near 1700 McNab Rd., located near Fort Lauderdale Executive Airport, just after 8 a.m. Early reports said the fire may have involved a crashed plane, but those were later confirmed to be false. According to Fort Lauderdale Fire officials, firefighters encountered heavy smoke and flames in the Conseal International Incorporated building. The fire was fought from above and was brought under control, officials said. HazMat teams went inside the building to evaluate if hazardous materials spread into nearby canals or waterways. The building contains cardboard and other shipping materials for the company, which specializes in specialty chemical products, officials said. One firefighter was taken to an area hospital with a leg injury. A three-block mandatory evacuation is currently in place, while there is a chance officials will put a three-mile voluntary evacuation in place.